The last two weeks I’ve had a good run. I was tired and fatigued as usual but I managed to have a week without headaches and feeling dizzy and sick. 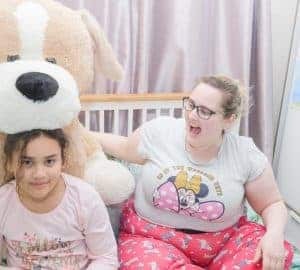 I’m grateful this was Christmas week and that I managed to get to my daughter’s Nativity and have a nice Christmas, however my Hypo-adrenal symptoms are back and I feel so ill once again. I’m back to laying in bed and feeling like crap. I could sense my BP dropping last night and so this morning I managed to get an emergency appointment with my GP. Having Adrenal Insufficiency, any added stress on the body will use up my “Cortisol” more quickly than usual. When this happens, I need to take extra cortisol, top up or double dose. The thing is, there is no way of knowing how low in cortisol you are on the spot, (like a diabetic can test sugar) and I have to go by how I feel. Also, I have to try with the Doctor to figure out what is causing me to get unwell so we can treat the underlying problem affecting my Adrenal Insufficiency which is a life threatening illness and can lead to death. It’s true. Last week an online friend with my condition was complaining of an infection and saying the hospital were sending her home. The next day I found out she had died. Adrenal Insufficiency takes lives and so I have to be very careful. This is in part why we came to live where we do, ten minutes away from the Accident and Emergency- a place I frequent most months. Underlying issues which cause my Cortisol to drop low are infections and fever and for me periods. I often find myself getting regular skin infections due to my steroid use. I’m dependent on steroids to stay alive, however, they also affect the quality of my skin and my immune system and I get regular infections. Whenever I get these infections, I am ironically given steroid cream to help get rid of them. This is a regular issue for me and something I never had to deal with before my diagnosis. I’ve had sudden adrenal crisis in the past when I’ve been in shock. I was in a supermarket and someone crashed their trolley into me. I suddenly dropped to the ground. Sudden surprises and shocks can knock my cortisol out of me and make me drop to the ground. I have an emergency injection for sudden unexpected crisis. Earlier this year my daughter stood on a nail. I was not stressed, we took her to the hospital and all was calm, however during the Journey, Sylvia went into shock. She went pale and dizzy and naturally this caused my adrenaline to pump (as it would in any mother). When we arrived at the A&E I was standing at reception when I lost my ability to speak and collapsed. Another Adrenal Crisis starting due to sudden stress. The biggest issue I have however and the one thing which has out me in hospital and made me the most unwell has been having a period. My first Endo said periods don’t put the body under stress to the point they affect Cortisol, however he was very wrong. Every single time I’ve had a period since 2013, I’ve had an adrenal crisis and gone to A and E or been admitted to hospital. The Endocrinologist finally recognised that for me a period is a dangerous thing. My Last period lasted 13 weeks and made me very unwell. I saw a gynaecologist and it was agreed that I needed a inter uterine coil – which will stop me from getting pregnant (as I’m not well enough for a baby) and will after 3-6 months potentially stop my periods. 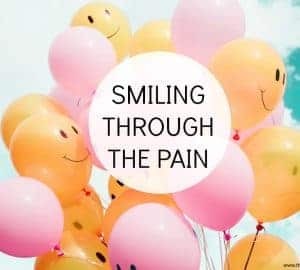 Last month a specialist at the hospital performed a biopsy (for another reason) and at the same time inserted a coil to start the process of stopping my periods. It wasn’t something I wanted but something that I know is best for me to help stabilise my health more. Unfortunately the procedure resulted in me going into an adrenal crisis (due to severe sudden pain) and I was rushed from the gynae suit to the Emergency department. I was given a lot of extra cortisol and within a few hours I was feeling much better. So 16 days ago, I had a new period. Clearly the coil has not started working yet, I have to wait 6 months and based on my strange cycle history this period could last another 3 months. I managed to get through the first two weeks okay but this week things got really painful and heavy and last night it affected my Cortisol levels. I began to feel the usual hypo adrenal symptoms. So today my husband took me to my GP in the wheelchair. My Doctor ruled out colds and infections and took my BP. My Blood pressure was on the low side and almost at the point where I usually go to A and E. I did a urine sample to rule out bladder infection and tomorrow I’ll be having a blood test to check for further infection. This has to be done so we can rule out possibilities. We concluded that it must again be my period and I was told to keep double dosing and if my Blood Pressure Drops further to go to the Hospital. So for now I’m back to laying in bed feeling unwell, dizzy and sick. I’m on Iron tablets and will be drinking plenty of fluids and eating some good sources of Iron and I will just have to ride this out however long it takes. Eventually I wont have periods once the hormones in the coil start to work and then one of the major causes of my adrenal hypos will be on hold. The longer I am unwell, the more I recognise my symptoms and know what is wrong. However due to being ill so often it can be hard to work things out. I’ll always feel exhausted and tired as my steroid tablets don’t mimic the cortisol levels the way an adrenal pump does. However the less underlying issues, the more chance of making my Adrenal Insufficiency more stable. They say that the longer you have AI, the easier it is to manage and work out when symptoms get worse. It will never be a simple condition but the more I can do to reduce added stresses on the body and work out whats going on when I am extra unwell more than my usual sickness, the better for me and the greater chance of staying out of hospital. It’s not an esy illness to live with and I’m slowly getting there step by step. Thanks for stopping by. i appreciate it. Hi Angela. Interesting to read your blog. Firstly have you ever had a day curve which will give you the precise amount of hydrocortisone you require and how long it takes to take effect in your system. Secondly why do you not have a Patient Specific Protocol with your local Ambulance Service. As I receive almost immediate paramedic assistance, I have almost eliminated hospital admissions so that I do not take the risk of affections. Thirdly, when you had the coil fitted you should have automatically taken additional hydrocortisone. Why are you not thinking of more drastic action of your periods. If you are convinced they are affecting your Addisons, obviously you eliminate completely that problem as you can do nothing about the Addisons. Lastly through the Addisons website, I know many people who have lived for many decades with Addisons and have even got through cancer treatment. You should therefore not look on the black side. Take a day curve, cope seriously with the period problem and connect with your Ambulance Service.. Additionally I have stand by antibiotics so like Christmas Eve I knew I was developing a chest infection, doubled hydrocortisone and took the antibiotics. Hi Lesley. Thanks for your comments, however you have made a lot of assumptions and totally misunderstood the purpose of my blog and I did not really find your suggestions helpful at all. Firstly I do not have Addison’s Disease. I have secondary Adrenal Insufficiency which is caused by the pituitary not working properly. I have had 3 Day curves but the results are always different as my brain sometimes makes cortisol and sometimes does not. It’s not exactly the same and I am regularly unwell all the time. It’s not as simple as a day curve for me. I’ve had plenty of day curves but am still unwell which is why I’m trying to get an adrenal pump. Just because you receive immediate paramedic support, it does not mean everyone does, some AI patients have even died in the UK due to lack of ambulance staff knowledge. This is one of the reasons my friend Rachel Pegler and has worked hard to increase awareness amongst ambulance services. On almost every occasion I’ve had a crisis the ambulance staff have been intrigued and said they have not dealt with the condition before and they have not known what to do. They have spent time looking info up in a booklet and had to ask my husband what to do.This was the case when I lived in Yorkshire and in Lancashire. Also the hospital have had to ask my husband what to do on occasion as they are not familiar with the illness. It’s not black and white and the same for everyone. You assumed I did not automatically increase my hydrocortisone when I had a coil fitted. Of course I did increased my Hydrocortisone. I am well aware about stress dosing and do so for any procedure I have. I would never put my life at risk intentionally. However the double dose was not enough and I went into crisis. This can happen. It happened when I had a dental procedure and so I had to triple the next time. My body can clear cortisol very fast I have found. 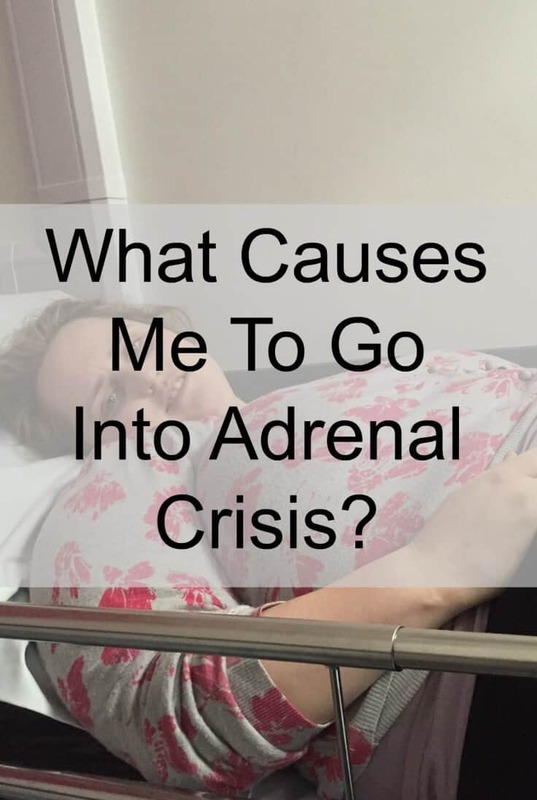 Again, you ask me why I’m not taking drastic action if my periods are causing adrenal crisis? That again is a major inaccurate assumption. I was reffered to the Gynaecology team because of this issue and they recommended stopping the periods with the coil. I am recently married and hope to have more children in the future so I’m not about to go and chop my womb out when I have plans to get an Adrenal Pump and get my health better managed. When I do get more well, I hope to have a second child. Yes people have lived with Addison’s for many years but many have also died from the illness. I hear of this every month, I have friends in groups who have died from a crisis, one this week it is a very real and serious condition. The research conducted at manchester Uni also shows that secondary AI patients often end up in hospital a lot more often which is why they wee looking at the pump to help them stay more stable. You say I look on the black side… I don’t think so. My blog is about awareness and sharing information about Adrenal Insufficiency with others. I have hundreds of people thank me for my posts and say how helpful they are and my Blog is about being positive and living the best life I can with illness. That is not the black side! Finally, it is not as simple as taking antibiotics and doubling up for me and many others. So often patients with AI,especially secondary AI, don’t know what is causing the problem and whilst we double up, we cant take antibiotics willy nilly when we are unsure if we have an infection in the first place. We also need to go to the doctor for antibiotics as it’s a prescription medication. I’m sorry but I found your comment quite judgemental and assuming and while you may mean well, this is the very reason, I write my blog, because of people like you who assume Adrenal Insufficiency is exactly the same for every one and that the TEXTBOOK is always right. When in fact more needs to be done to help people with my condition, more research needs to be conducted and more awareness raised, because awareness saves lives and provides a means for empathy and understanding. I am so glad you had some good days for Christmas. I did too, but am battling a bad Thrush problem in my mouth, you never know what will happen next. So sorry about your friend. Thanks Maureen. Sadly Adrenal Insufficiency does take lives… which is why I am fighting hard to get the best treatment for me and then in the future for others too! Hi Angela, Hope you’re starting to feel better. Your conclusion about periods causing a crisis is something I had suspected in regards to my daughter but was told by the endo that it wasn’t true. Have you considered crowd funding to get your pump? Oh and by the way, the title of this post is What cause “ME” to go into adrenal crisis not everyone and it is meant to be a interest piece to help others who are still working this out for themselves, not for people who have had the illness decades and know everything about how their body works with the illness. Hi thanks for sharing. It’s great when I here of people with Addison’s who are able to live normal lives. I have been trying to get the right help for many months and it’s not that simple..but I will keep trying to get the help I need. I cannot live a normal life being as sick as i am but i do know i could if i got treated correctly so that is my goal. Angela I just wanted to say thank you so much for this blog. It’s been so helpful and informative for me. I’m 32 live in Melbourne Australia and I was diagnosed with Addison’s disease about two months ago though I suspect I probably had it for a couple of years. Until I went to hospital and got diagnosed I hadn’t even heard of it so I did a lot of googling from my hospital bed. I have learnt so much from your blog you write beautifully. You explain things very well and I can picture what’s taking place. I have been trying to find out about the experience of others with Addison’s but as you know it’s very rare so this isn’t easy. Though your experience isn’t exactly the same as mine reading this has been the next best thing to talking to other people in my shoes. I have shared this with friends and family. All the best and thanks again. Oh Katie, I am glad this has helped you. Yes I think AI can be a little different for each individual and the symptoms may vary but I’m glad it helps you and hope it can help. Good luck with your treatments Katie. He has helped a lot of people, some I know and me. I have Adrenal Exhaustion (and had Adrenal Crises more than once) and believe I have always had it but now control it through information I received from Dr. Brouse. You can do everything by phone and mail. He can get to the bottom of your challenges and help you control or reverse the condition.